Be a PIONEER in HAM TV ...build your own camera! BRAND NEW KIT MAKES ASSEMBLY EASIER AND MORE FUN THAN EVER! 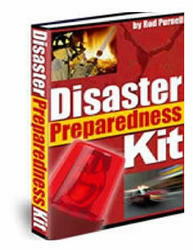 J THE ilivir MOW ¡OLID'iTm CAMERA KIT AVAILABLE. •Special ltKtay~discomit ptice. Rrgvlv $129.95. Vidian jr ctd sepvately IV,/fj PrICEs penpaid. ItW TILECASTING it m exciting foni.ly type tiobby, *riti or ¿all foe FS££ catalog of hits.plans, etc. would be 7.00071 MHz. With maximum low-side error, this would still come out as 7.00071—0.0070071, or 7.0000099 MHz, less than 10 hertz inside the band limit. The way to calculate the tolerance is to add the tolerance to 100%, then multiply the band-edge frequency by the result if you're ordering for the low end of the band, or divide the band-edge frequency by the result if you're going for the upper end (either way, your answer will be farther inside the band than the exact limit). Then round off the answer in the direction which takes you still more inside the band. While we've discussed tolerance mainly in connection with crystal resonators, an LC resonator has tolerances too, and the same kinds of considerations apply. Any time operation is planned near a band edge, it's necessary to be certain that you know exactly where that band edge is, and keep your signal on the legal side of it. The major advantage of the crystal resonator is its stability, but at the same time this leads to a drawback. The frequency of a crystal resonator is difficult to change. Because of this, variable frequency oscillators (vfo circuits) using LC resonators are highly popular. Both crystal and variable frequency oscillators ©perate in essentially the same way; the major technical difference is the type of resonator usedj. and the major operational difference is that the vfo is less stable but often more convenient to use than is the crystal. Most of the common oscillator circuits come in both crystal and vfo forms, but sometimes different names are applied to the two versions of the same circuit. Since all oscillators used in radio transmitters must include the three basic components shown in Fig. 3, the major differences between different oscillator circuits are the ways in which these components are interconnected. In most cases, but not all, the variations occur in the connection of the feedback network. The feedback network must couple output back to input in the proper phase, and with the proper feedback fraction, but so long as it accomplishes these two tasks everything else about it is free to vary without limit. Thus it can be placed at almost any point in an amplifier circuit where it can mesh output with input. Some oscillators (such as the Armstrong and tune-plate-tuned-grid circuits) have it connected to the plate, while others (such as the Hartley and Colpitis arrangements) have it in the cathode circuit. Figure 4—8 show several oscillator circuits, including those in most common use today. In all these illustrations, the feedback network is indicated by heavy lines. Fig, 4. Armstrong oscillator; feedback is via a r "tickler" coil. oscillator. It works only with an LC resonator, which is in the grid circuit, and the feedback is applied by means of a coil in the plate circuit which is coupled to the grid coil. This plate coil is called the "tickler" and its number of turns is adjusted to vary the feedback fraction. The Armstrong oscillator is virtually obsolete today, although it's still around in some regenerative detector circuits and sometimes finds use in receiver local oscillators. We include it both for its historical intprest and because it spotlights so clearly the feedback function of all oscillators. Figure 5 is the "tuned-plate-tuned-grid"
Fig. 5. Tune-pJate tuned-grid oscillator feedback path runs through the grid-plate capacitance of tube. crystal replacing the grid tank circuit. (TPTG) oscillator. This circuit is identical to a triode amplifier circuit which has not been neutralized, and oscillates when the plate and grid circuits are tuned to slightly different frequencies. The feedback path in this one is through the tube, by means of plate-to-grid capacitance. While the TPTG oscillator is also obsolete, its basic principle survives in the circuit of Fig. 6. This circuit, the Miller crystal oscillator, simply substitutes a crystal resonator for the TPTG's tuned-grid circuit. The resulting oscillator is widely used in VHF transmitters. As in the TPTG, feedback is through the tube, and plate-circuit tuning is critical. For best results, the plate must be tuned to a frequency slightly different from the crystal. Fig. 7. The Hartley oscillator is always identified by a cathode tap on the coil. coil tap rather than to ground. Feedback is via the cathode circuit, and is adjusted by varying the tap position (normally by adding or removing turns at the grid end of the coil, which effectively moves the tap down or up the total coil). This circuit is almost universally used for receiver local oscillators, and is also found in transmitters both as a vfo and in a crystal version. In the crystal version, the crystal does not replace the LC tuned circuit. Instead, it replaces the coupling capacitor from grid to tuned circuit. The most widely used oscillator circuit at present, however, is the one shown in Fig. 8. This one, identifiable by the two series-connected capacitors from grid to ground and the cathode connection to the junction of these capacitors, goes under at least three different names, which identify the variations shown as A, B, and C in the illustration. Fig. 8. Capacitance feedback circuit goes under various names, depending on the tuned-circuit arrangement. All three versions obtain their feedback from the cathode circuit, by voltage-divider action in the series capacitors. The circuit is electrically equivalent to the tapped coil of the Hartley oscillator, but in practice is easier to adjust because either or both of the capacitors may be an adjustable trimmer, permitting convenient adjustment of feedback fraction. The differences between the three versions all involve the resonator portion of the circuit. When a high-capacitance, low-inductance LC resonator is used and connected as shown at A, the circuit is called a "high-C Colpitts" oscillator. This version is popular as a vfo. It can be designed to permit extremely precise tuning and high stability. When a low-capacitance, high-inductance LC resonator is connected as shown at B, the result is the Clapp oscillator. At one time this circuit was almost exclusively used for vfo's, but in recent years its sensitivity to small changes of capacitance has caused it to decline somewhat in popularity. It's still around in goodly numbers, though. When a crystal resonator is used as at C, the circuit is called both a "grid-plate" oscillator and a "crystal Colpitts" circuit. Quite possibly more crystal oscillator circuits in use today are of the Colpitts variety than are of any other single type. Since no tuning coil is necessary, the circuit covers a wide frequency range; all that's necessary is to plug in a crystal for the frequency desired. Addition of a tuning coil in the plate circuit makes it easy to pick off any desired multiple of the crystal frequency — a popular feature with VHF operators who often use this circuit with an 8 MHz crystal to get 24 or 25 MHz output direct from the oscillator by taking the third harmonic of the crystal frequency. Stability is excellent, and power output is adequate. What's Unusual About the Amplifier? 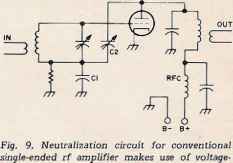 We've already examined the subject of amplifiers in general several times so far in this study course, but the amplifier of a transmitter is a bit different from the common run of amplifier circuit. Our question, then, is "how?" In a transmitter, the amplifier portion serves several purposes. Most obvious is its action in stepping up the relatively feeble output of the oscillator to the power level desired for feeding to the antenna. Not so obvious is its action of "isolating" the oscillator from external influences. The oscillator, you see, is a rather sensitive circuit. Almost anything - a change in operating voltage, variations in the applied load, or mechanical vibration — can cause its frequency to change. This is something which we do not wish to have happen, and so we connect an amplifier between the oscillator and the antenna even when the oscillator is capable of delivering enough power by itself, in order to provide a constant load on the oscillator and let the variations of operating conditions all be applied to the amplifier. While the amplifier is performing both these functions, it must of course not introduce any unwanted output frequencies of its own, nor must it influence the oscillator's frequency, itself. 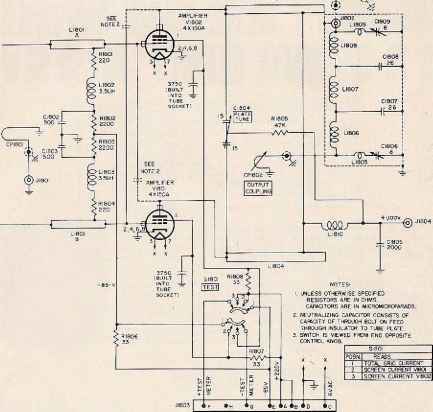 The result of these requirements is that the portion of a radio transmitter which we are here calling "the amplifier" normally is not just a single amplifier stage, but instead is a whole string of amplifiers connected end to end. Some are designed to provide isolation, and some for power handling. The last stage in the amplifier (the one which feeds the antenna) is called the "final" for reasons which should be apparent. Between the oscillator and the final, we may encounter "buffer" stages which are intended primarily to provide oscillator isolation, "driver" stages which are intended to boost power level up to that required by the final as its input, or both. The buffer stages accomplish their function of providing isolation in several ways. To begin with, every amplifier stage, whether intended as a buffer or not, provides at least some isolation between the stage which precedes it and the stage which follows. Some buffers, then, are indistinguishable from any other rf power amplifier designs. Occasionally a circuit designer will set up a buffer stage to operate in class A rather than in class C (the normal operating condition for rf power amplifiers). This is done because a properly operating class A amplifier imposes no load on the stage which precedes it, yet is capable of providing sufficient power output to drive a class C stage behind it. If a class A buffer is used, it normally is driven by the oscillator itself; with no (or little) loading upon the amplifier, frequency stability is increased. Another trick sometimes used in buffer design is to employ a cathode follower rather than a normal grounded-cathode circuit. The cathode follower, with its 100% negative feedback, is noted for its isolation-providing capability. While it cannot produce any voltage gain, it can and does provide power amplification. One of the most popular techniques used in buffering, though, is to operate the oscillator at some submultipie of the desired output frequency, and then use a frequency-multiplying stage or stages as the buffer. A frequency multiplier looks just like an ordinary amplifier, but is operated with additional bias (deeper into class C), and its input and output circuits are tuned to different frequencies. The class C operation provides current pulses in the output circuit, and if the output tank is tuned to a frequency twice that of the input, these pulses witl occur every other cycle of output frequency. That's often enough to keep things going; multiplication of up to 5 times in one stage is possible. With the input and output circuits of the multiplier stage operating at different frequencies, isolation between them is naturally better than if they were on the same frequency. This technique is virtually standard practice with vfo circuits. Most ham vfo's operate in the 1.75 MHz region to provide output at 3.5 and 7.0 MHz, and in the 7 MHz region for output at 14, 21, and 28 MHz. VHF vfo's usually operate in the 8.0 to 8.33 MHz region, providing output at 24 or 25 MHz, which is then multiplied again in the transmitter, by 2 to reach 50 MHz and by 6 to get up to 144 MHz. Frequency multipliers are also used as drivers, but their efficiency is much less than that of "straight-through" or "straight" amplifiers (those in which input and output are on the same frequency). A multiplier which doubles its input frequency provides about half the output that the same circuit would give in straight through operation; a triplet gives about one third, a quadrupler about one fourth, and so forth. One great advantage of multiplier stages is that they cannot oscillate because the output signal is different in frequency from the input signal, and so feedback cannot be sustained. A straight through amplifier, on the other hand, is virtually the same circuit as the TPTG oscillator, and if triodes are used it must be neutralized to prevent "self-oscillation." Even with multigrid tubes, which make it possible to operate without neutralization, it's still a good idea to neutralize all straight amplifiers in a transmitter, to keep out of trouble. Neutralization is the technique of cancelling out all positive feedback from an rf amplifier stage, in order to make it impos sible for that stage to oscillate. While the amplifier may have been designed to avoid positive feedback, when the thing is actually built it's almost impossible to get rid of all possible feedback sources. Stray capacitance, power wiring, magnetic coupling between coils, and similar factors bring in feedback whether we want it or not. Careful parts layout can minimize the problem, but cannot eliminate it. Since we cannot eliminate all the positive feedback, we neutralize it instead. We do this by adding negative feedback to the circuit. The negative feedback cancels out the positive feedback, and the net result is (ideally) no feedback at all. In practice, we usually adjust everything to slightly "over-neutralize" the stage, in order to have a safety factor against component aging and the like, and also because our means of detecting exact neutralization are not completely accurate. Several procedures may be followed to properly neutralize an rf amplifier. All involve balancing out the unwanted positive feedback by artifically supplied (and adjustable) negative feedback, and detecting the balance point by means of a sensitive indicator. The negative feedback is usually taken from the plate circuit to the grid circuit. Figure 9 shows a typical neutralization circuit, based ori recommendations in the ARRL handbook. Capacitor CI is the normal bypass capacitor for the grid tank, and C2 is the neutralizing capacitor. divider action of capacitors C2 and CJ, in series, to provide negative feedback from plate to grid circuit. CI is normal grid bypass capacitor and C2 is called the neutralizing capacitor. Normally Cl's value is fixed and C2 is variable. By adjustment of C2, negative feedback through neutralization circuit is made to balance out any positive feedback from rest of circuit which might cause amplifier to oscillate. impedance at any frequency, and so the two capacitors together form a voltage divider between the tube's plate and ground. The small part of the plate signal which appears across C2 is thus fed back into the grid circuit, and the capacitance ratio between CI and C2 determines the feedback fraction. The feedback is made negative, as required, by the fact that plate and grid voltages in a grounded-cathode amplifier are exactly out of phase with each other. Adjustment is accomplished by varying the value of either CI or C2, leaving the other's value fixed, until no feedback exists. In most transmitters, C2 is adjusted and CI is fixed in value. Special "neutralizing capacitors" with very small capacitance and high-voltage insulation are available for this purpose. Alternatively, C2 can be left fixed, and Cl's value adjusted. In this case, high capacitance trimmers or variable capacitors are required at CI, but the requirement for high-voltage insulation is minimized. Whichever of the two is adjusted, the procedures are the same. We eon supply crystals from 2 KHz to 80 MHz in many types of holders.